The wonderful world of Round 2 continues! Set your stock, ready your timer, it's time to Smash ahead! The first matchup in the Lip's Stick bracket was quite a Pokemon battle! However it was the David in this David and Goliath story that won as Charizard was beaten horribly by Pikachu. When Marth and Palutena were matched up it was quite a bit closer but Smash gamers just didn't take that much appreciation for the goddess. Things were even closer between 3rd Party character Snake and Ivysaur. Snake's unique playability won over the forums hearts. Finally it was Ganondorf and Falco. Both are clones but Ganondorf's strong personality seemed to have beat out Falco. The second of three Fire Emblem characters in this bracket was up against the very unique Villager from Animal Crossing. So naturally, Roy, got the axe! 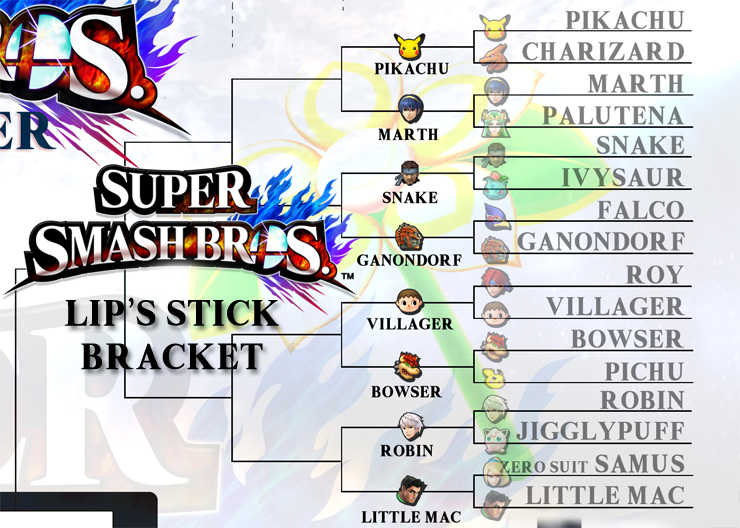 In the greatest win for the whole bracket, Bowser squished the Pikachu-wannabe, Pichu, at an 18-2 vote! 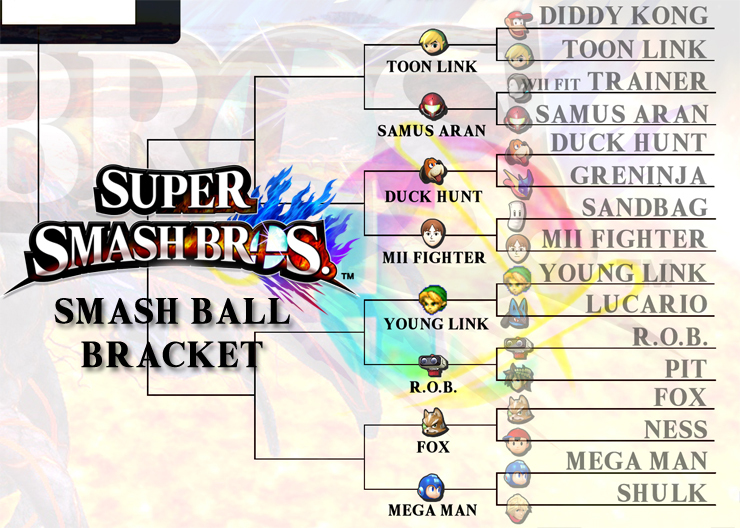 Jigglypuff was the fifth Pokemon in this bracket and she gave Robin a run for his money. Yet, the newbie from Fire Emblem actually managed to nab a couple extra votes and nab the win. Lastly, it was a unique matchup in Zero Suit Samus and the powerhouse Little Mac but Little Mac ended up knocking her out. The fourth and final bracket got way more interesting with a severe lack of Pokemon and Fire Emblem characters. Starting us off was a close race between Diddy Kong and Toon Link! Both have their fans and were beloved by some but it was a final vote that secured Toon Link's cartoony win. Another close match was well closer than anyone could have suspected. Two strong women, Wii Fit Trainer and Samus Aran, were pitted head to head. With one final vote, Samus took the win and Wii Fit Trainer was exhausted. In Super Smash Bros. for Wii U and 3DS, the announcer yells Greninja in a really unique way… but it wasn't enough to get him the win. Duck Hunt beat him out at over five times the votes. The Mii Fighter was up against perhaps the most dastardly opponent yet… the Sandbag! We needed the Sandbag because we were one short for this whole thing. It was surprisingly close too at 11 to 8 but the Mii Fighter took his signature look and pummeled the Sandbag. Hasn't been seen since Melee but Young Link came back to whip Lucario back to the Sinnoh Region! Dark Pit and Palutena may have been iced early on but it was finally time for Pit to take hold! Unfortunately for him, he was up against R.O.B. and knocked out of the sky by lasers! In the final very close match of Round 1, Ness and Fox were pitted against each other. Two very different franchises and characters… this led to a bunch of differing opinions. Fox scooted ahead in the last call and beat out little Ness. Finally, the last match up was a pairing of two of the Smash Bros. series' most unique surprises. Mega Man versus Shulk! What was more beloved? By three times the votes, the Blue Bomber beat out Shulk. Now Shulk's really feeling it… and 'it'… is disappointment. Enjoy your new match ups! Vote for the character that you think should win the matchup. Please vote on every matchup. Polls are open until Saturday, October 1st, 2016 at 11:59 PM EST. Who will enter this fray!? Negative World Podcast 064 - Mario Kart Ate My Space and Time!!! Negative World Podcast 086 - Mock It To Me! Of all the Fire Emblem characters, Marth is NOT my favorite. Pikachu though is pretty fun to play and fight. This was a tough call and I could see it going either way. I'll pick Ganondorf for his looming personality. Villager is such a unique character that a skilled player and be quite an entertainment. Easily beats out the slow Bowser in my eyes. Robin who? Little Mac is such a fun character to play as. Huge fan. I know Samus is a cool character with a cool series, but Toon Link is such a delightful version of one of the best characters ever! I love playing as Toon Link and I love the Wind Waker stage from Brawl. Duck Hunt is another really unique character who, like Villager, is so fun to watch and play as if you can play well. Mii Fighter is just a way to make Hillary and Trump battle it out ahead of the debates. Young Link was one of my favorites in Melee but I feel Toon Link is a better Link and R.O.B. is way more interesting these days. Fox is a cool character from an okay series. Mega Man is an awesome character from an awesome series! I fear Robin will be gone this round. Le sigh. S/he was never fully appreciated as s/he deserved. I quite like Marth and find him much easier to play as, but Pikachu's grown on me a lot the last few years, particularly as a spectator. Snake was given a lot more TLC for his inclusion than Ganondorf was. The latter turned out pretty well anyway, but Snake's favoritism shows. Villager's fun and quirky, but I have a soft spot for the slow, heavy-hitters. Tough call! Smash 4 did a great job with its newcomers, and these are two of the best! But Robin's versatility beats out Mac's fun but one-dimensional game. Two characters who can wall out with projectiles or go in. But Samus's floaty movement kinda makes it all the more nutty when she does cool stuff. Appropriately, a 3-on-3 battle: Duck, Dog, and Zapper versus Brawler, Swordfighter, and Gunner. I like when rivals put aside their differences to unite against a greater evil, so I have to give it to the dog/duck team-up. Metal Blades > metal legs. These are my picks too! Neat! I'm sad that Ness got eliminated already, although it does save me from making the super-difficult choice between Ness and Mega Man. Pikachu is OG, and Marth is not. That's really all I have. Snake was one of the most original, brilliant characters to come into the SSB universe. It's a shame he was only a one-off. Villager is unique in a lot of ways. While I like Bowser, I prefer Villager's style. Duck Hunt is such a fun character! It's cool to get my Mii in the game, but that's about all I use the Mii Fighters for. Link should be an adult. Period. Fox is OG, but Mega Man has an awesome moveset. Pikachu has been my #1 since 1999. Once again, a lot of love was put into Snake. This is a tough, tough, tough choice! Bowser is such a fun heavy-hitter, but Villager is just so good! Ummmmm... Guess I'll vote for Villager, even though he/she has a few nonsensical (yet awesome) attacks that have nothing to do with Animal Crossing. Both are good contenders, but only one is a classic. I feel like Nintendo dropped the ball on the Mii Fighters, specifically not allowing them during regular online sessions. BOO. R.O.B. is neat because he's the only hardware-based character. So yeah! I'm better with Fox, but Mega Man is just too iconic and fun not to vote for.... For now. My IGN handle for YEARS was "deathbypika" - who else would I vote for? Snake sneaks up on the King of Evil and slits his throat before slinking back into the shadows. hardest difficulty with Bowser, so my vote goes to the King of the Koopas. I was just more excited to see Little Mac join in on Smash. 4-year old Link is actually one of my mains. I rather like the "trio" of fighters for this character more than the create-a-character. I may be mistaken, but I think Young Link was based off of his appearance in Majora's Mask. Which is one of my favorite Zelda games. I liked R.O.B. better in Mario Kart. The Blue Bomber takes this one pretty easily, for me. More faves gone of course. Phooey!